"Although zucchini in a sweet bread may sound unusual, this moist, cinnamon-scented bread is truly comforting and delicious." Grease and flour 2 4x8-inch loaf pans. Beat eggs, sugar, canola oil, vanilla extract, and zucchini together in a large bowl until well combined. In a separate bowl, sift together unbleached flour, white whole-wheat flour, baking soda, baking powder, salt, and cinnamon. Mix the dry ingredients into the zucchini mixture, a little at a time, stirring until just combined. Bake in the preheated oven until bread is lightly browned and a toothpick inserted into the center comes out clean, 40 to 50 minutes. 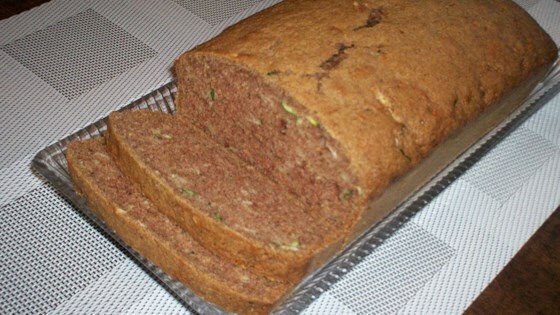 This zucchini bread was awesome. I did add more cinnamon but the fact that its half enriched white flour and the other half is whole wheat is a bonus.